Dec 30, 2002 - Here are two feature articles from Graham Windle, the Bugatti Rail Racer and Graham's 2002 Year-end Round-up, which includes the Pendle Popsicle Race, RIKO motors, and a Revell Chassis. Enjoy! Dec 29, 2002 - See three vintage chassis built from Kemtron kits in My Collection (42, 43 and 44). Dec 27, 2002 - Recall 60s slot racing on New York's Long Island, in Where We Raced! 3 by Ron Manna. Dec 15, 2002 - See four significant slot cars from Don Siegel's Collection, including a Shinoda-bodied chassis! Dec 12, 2002 - I posted Chassis of the Month for December, the unique Brass Rod Anglewinder, built by Doug Azary. Dec 12, 2002 - Enjoy a chassis building article by the builder of December 2002's Chassis of the Month, Doug Azary. Building the Brass Rod Anglewinder. Dec 11, 2002 - Solder along with Doug Azary: Restoring a '67 Chassis! Dec 2, 2002 - Ready, Set, GO! Nov 28, 2002 - Let's look underneath a British Slot Stox with Graham Windle. Nov 28, 2002 - Scott Grandstaff shows us a vintage box of brass Scratchbuilder's Parts. Nov 27, 2002 - I add three more chassis in My Collection (31-33): a Wire chassis, another Wire Chassis and a Hollow Pan Chassis. Nov 24, 2002 - Graham Windle presents: The Black Art of Scratch Building, or VACFORMERACHA!! Nov 20, 2002 - I posted five chassis into My Collection (#s 26-30): a Brass Rod Sports Car Chassis, a One Rail Chassis, Pan Bashing!, Sawn in Half! and the Mini Trick! All good entertaining stuff! Nov 9, 2002 - Have fun! The Third Chassis Quiz is underway! Nov 7, 2002 - See three vintage cars built by Jack Fine, from Doug Azary's collection, Reader's Gallery 29-31: a Lotus 40, a Lola T-162, and a Cooper Ford. Superb! Nov 6, 2002 - Must see! Six 1/32 RIKO Chassis from Graham Windle's collection, sure to bring a smile to your face! Nov 4, 2002 - You may have noticed that 3 of our regular contributors now have their own pages! Many thanks to Doug Azary, Jack Beers, and Graham Windle, for making this website a much better place! Oct 31, 2002 - In the spirit of Halloween, we present: The Batmobile! Holy Deslot Duo, Doug! Oct 31, 2002 - This Lola Enduro car and chassis by Doug Azary was built with advice from an Apollo engineer. See, it is rocket science! Oct 28, 2002 - We held a Retro Rewind Party! Remember this stuff? Oct 26, 2002 - I have written a new article, Compare Four Vintage Chassis. Comments and corrections are always welcome, posted to our Message Board. Oct 25, 2002 - I've added five more chassis to the My Collection area (21-25), including a new Chassis of the Month! Oct 20, 2002 - See two new brass chassis in the Readers Gallery from Doug Azary. Cool! Oct 20, 2002 - At our Message Board, using the 'New Messages' link makes it easy to join in the latest topics! Oct 20, 2002 - See three unusual brass chassis from the Graham Windle collection. Graham always comes up with things I've never seen! Oct 18, 2002 - Alert! The Second Slot Car Chassis Quiz is underway! Have fun! Oct 17, 2002 - Visit The Slot Car Motor Junkyard! See anything to salvage? Oct 16, 2002 - See three pre-1966 vintage chassis from My Collection (18-20). Enjoy! 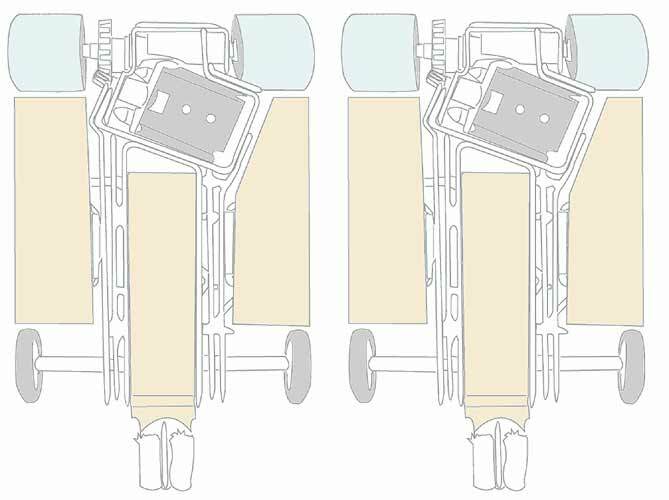 Oct 15, 2002 - Here is a new section based on our Chassis Quizzes, Identify Your Slot Car Chassis! Oct 15, 2002 - You're a serious motorhead? Try Identify Your Slot Car Motor, the Can Motor Size Guide, and The Motor Quiz, with 54 motors! Oct 12, 2002 - Smile, you are in for a treat today! Check out these Highlights from Jack Beers' Collection of vintage slot cars! Oh boy! Oct 11, 2002 - I've added two chassis to My Collection (16-17). Both are Dynamic chassis with scratchbuilt additions. Enjoy! Oct 9, 2002 - I don't normally accept non-metal scratchbuilts, but when Graham Windle said he made chassis from popsicle sticks and electrical trunking, I just had to see them! - Oh my! Oct 8, 2002 - Here is the first contribution from Doug Azary, a reproduction 1966-67 Brass Rod Chassis, seen recently at an auction website. We sure hope to see more from Doug around here! Oct 7, 2002 - Try our First Slot Car Chassis Quiz, to help build a knowledge base, so our visitors can identify their own vintage slot car chassis. You can post your answers to the Message Board. When we get enough answers, I will work it into a new Identify Your Chassis section. Oct 6, 2002 - John Secchi rounds out his contributions to the Reader's Gallery with a Retro Brass Anglewinder and a vintage Champion 285 Inline Chassis. Will we see more from the Secchi collection? We can hope so! Sept 20, 2002 - Here are three beautiful and historic vintage steel chassis, contributed by John Secchi. Sept 18, 2002 - See the Stainless Steel Tuning Fork chassis, contributed by Graham Windle. I don't remember ever seeing one of these before - thanks Graham! Sept 16, 2002 - John Componeschi adds his Vintage Limpach 888 to our Reader's Gallery. Great! Also be sure to see John's Where We Raced! segment, which features some vintage slot car decals. Thanks! Sept 14, 2002 - Final update (for now) of Books, Magazines and Ephemera. These lists serve as a bibliography for our research. Sept 6, 2002 - The latest contributions in the Reader's Gallery are two beautiful scratchbuilt chassis by Phillip Niyazi. The first is a reproduction of a 1969 Bob Emott pro chassis. The second is a reproduction of a 1970 Ed Lewis sidewinder. Awesome! Sept 1, 2002 - For the very definition of asymmetric chassis, see the three Cheater Wells Oval Specials, in the Reader's Gallery! August 29, 2002 - I've added the first (I hope) of many installments of Where we raced! I included drawings of two tracks, as I remember them. August 29, 2002 - Al Penrose has contributed an article, Building the BWA Super Womp NASTYCAR! Enjoy! August 28, 2002 - I re-did the Big Three Slot Car Magazines Checklist so it is more readable. If you checkmark the issues in your own collection, then print the list, you won't have to dig through the pile every time you want to bid on ebay! August 27,2002 - See new vintage chassis in the Reader's Gallery, The Baker Specials. Check them out! August 26,2002 - I've written an article, The Soldering Phenomenon. I'm sure you have similar stories to tell. August 25,2002 - I've added even more new info to Books, Magazines and Ephemera - I'm on a roll! August 25,2002 - We now have a Message Board! Hooray! I suppose this means that this website is officially open! Cheers! I have more photos, articles and info in the pipeline. Enjoy! August 24,2002 - I've added new material to Books, Magazines and Ephemera, so check it out! I'm sure there will be many additions and corrections. You are invited to help! July 30,2002 - An 888 Clone and a Dynamic + Pan Chassis for the Reader's Gallery have arrived from Al Penrose (BWA). Check them out! July 27,2002 - I replaced a number of pictures in my collection, which were blurry. I also added some larger pictures and close-ups. More to come! July 26,2002 - I wrote a short article, You say chassis and I say chassis! about the pronounciation of the word chassis. July 26,2002 - I wrote a Mission Statement and My Slot Car Bio. Enjoy! July 23,2002 - The first Reader's Gallery contribution is this beautiful repro by Bob Suzuki. Thanks Bob! July 23,2002 - I made a special page about the Skeels/ProSlot chassis in my collection. July 23,2002 - I placed online another 6 chassis from my collection. July 23,2002 - I posted some corrections. Though this website is not yet public, I've already had some unexpected "beta testers." Thanks, guys! Keep up the good work! July 22,2002 - Placed online the first checklist of slot car magazines. July 22,2002 - Placed online the first nine chassis from my own collection. July 21,2002 - Deployed the first scratchbuilt dot com web site content: a slot car chassis from my collection. July 7,2002 - The first draft of scratchbuilt dot com tested online, with the original background. Almost a year has passed since I bought the domain name! August 22,2001 - I conceived of the idea of a website dedicated to the handmade brass slot car chassis that I loved reading about as a kid. I thought up and bought up the domain name, scratchbuilt dot com.